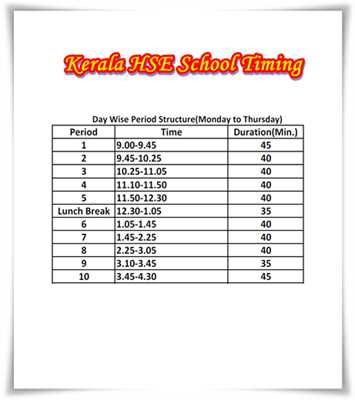 The higher secondary schools in Kerala will have a five –day week effective from 1st July 2014. The decision was taken on the basis of the report of the P. O. J. Labba Committee appointed by the state government. Meanwhile the recommended continuing with the six-day week for vocational higher secondary as it would not be enough to give complete vocational training to students. Presently, the higher secondary schools followed a six-day timetable with all Saturdays except second Saturday being working days. With a change in the timetable, the working hours of the schools will be changed from the existing schedule of 9.15 a.m-- 4 p.m. to 9.00 a.m.-- 4.30 p.m. It had been a long time since the teachers in the higher secondary sector pointing out about arranging classes on Saturdays while it remained holidays for classes I to X and also for colleges. According to the revised time schedule, there will be a total of 47 periods in a week. There will be 10 periods from Monday – Thursday while Friday will have only 7 periods. 2 periods in a week is being allocated for physical education. If the first period from Monday to Thurday is scheduled to have a duration of 45 minutes, Friday will have a timing from 9 – 9.55. On Friday, the lunch break has been extended making 90 minutes while it is stipulated to 35 minutes on the other days. As Saturday's remains holiday for the higher secondary, teachers and students would get enough time to prepare their lessons. The other recommendations made by the Labba committee include the thorough revamp of curriculum, syllabus and textbooks for both Higher Secondary and Vocational Higher Secondary courses once in every five years. Added to it, the committee recommends conducting public examination for Class IX. Other recommendations are time bound promotion of HSST Junior and HSST senior posts, students strength should be1:40 per batch, Grading of HSS as per NAAC model, enabling more regional offices to higher secondary department. The committee also gives proposal to reduce the work load of the principals.